office - hunting - recreationalDELUXE CABINS are waiting for you! Deluxe Cabins Have Endless Possibilities! 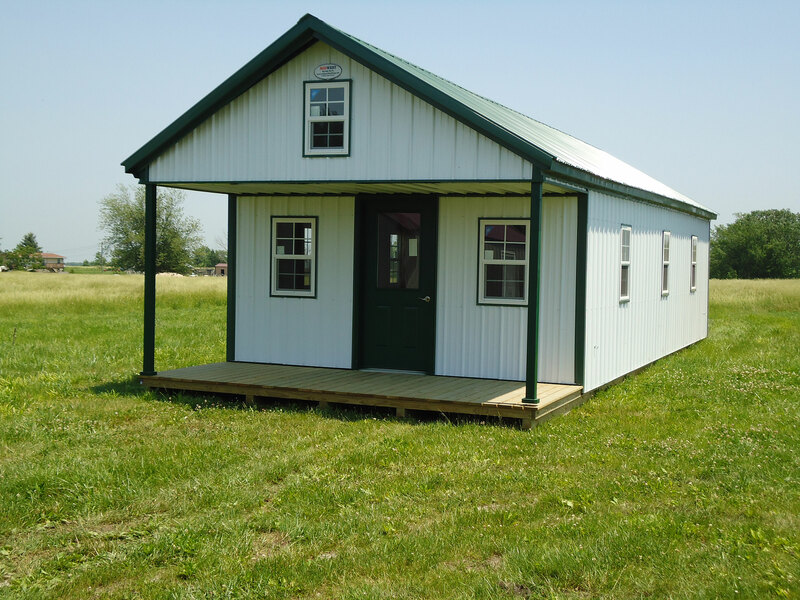 Deluxe Cabins are your smart choice for your office building, hunting lodge, or cabin by the lake. Their cathedral ceiling allows for an 8′ loft in the front and back of the cabin. The front loft area has a 18” x 27” aluminum window in it. Both loft ends have a portable ladder for easy access. A 6′ front porch is waiting for you to sit on. With or without a wooden railing your porch adds quality, beauty and dimension to your Deluxe Cabin. Your 6′ porch does not add any length to your building. FOR EXAMPLE: If you purchased a 15′ x 40′ Deluxe Cabin your indoor cabin area would be 15′ x 34′ + a 6′ useable loft over your porch. A 6′ covered porch is under your front loft.